Charco Azul, also called the Blue Pool, is indisputably one of the most magnificent water spots in the Canary Islands. It is a natural creation formed from flowing lava. Massive rock formations provide the turquoise pools privacy from the raging waves of the Atlantic Ocean. Situated in the town of La Frontera, Charco Azul offers the precious advantages of seawater. 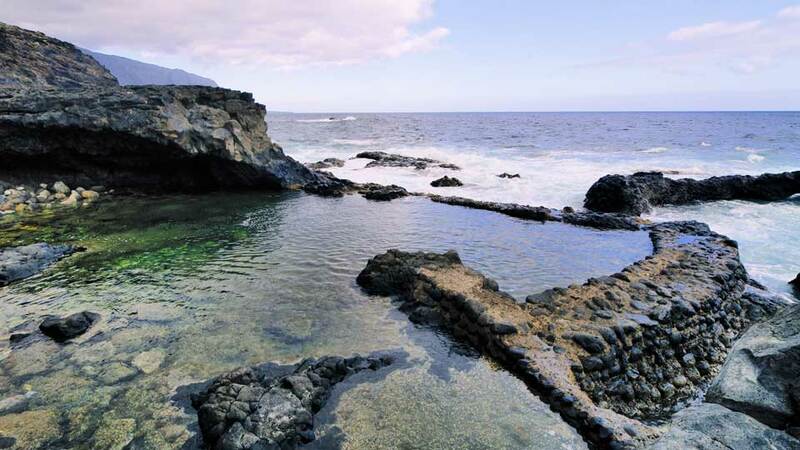 Charco Azul is located in the less-crowded western part of El Hierro, thus making it one of the most unspoiled water attractions in the world. Easy to get to on foot, the area features wooden sun decks and a basalt arch which crowns the pool. There are also diving points for the more daring visitor. The waters of Charco Azul will relax, refresh and recharge each of its guests’ body and soul. While famous artists may not have designed the place, it was crafted by nature, which is better a thousand times over. Tucked away in the coastal borough of Los Llanillos, this hidden gem is a challenge to reach. There is no public transport from the airport so guests must take private vehicles to get to the area. From the islands of La Gomera, Tenerife, and Gran Canaria, visitors can board flights or ferries without much difference in the fares. There are daily scheduled flights from the three islands to El Hierro. Alternatively, visitors may take the slower ferries to enjoy the view of the seas and different islands. There are daily return sailing trips from Tenerife to El Hierro. Head southeast on HI-3 toward Ctra. El Cangrejo/HI-25 then turn right onto HI-2. Turn right onto Calle Las Pernadas/HI-5 then another right onto HI-550 and keep the same speed until HI-551 then a sharp right to Calle Charco Azul. Charco de Azul is more of a half or one day stop for visitors who want the ultimate tranquility. 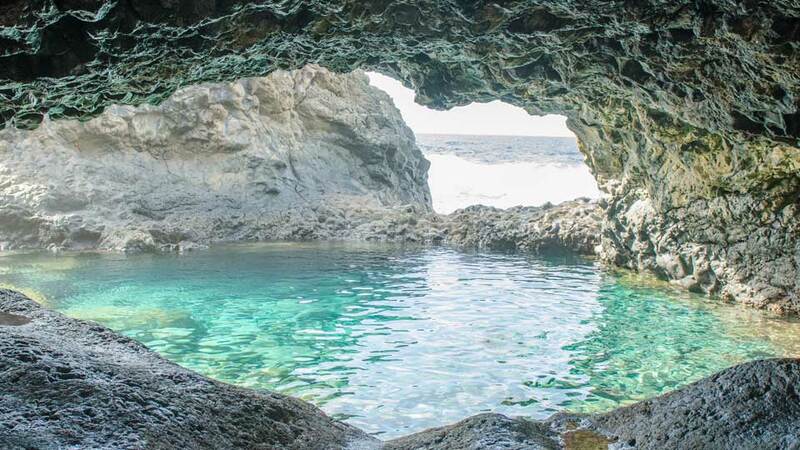 After a couple of hours lounging in the natural pool and appreciating this wonder of nature, guests may wander around the island’s other sites. Swimming in the Atlantic Ocean is a pleasure but experiencing its natural pools is what makes it one for the books. Taking a dip into the cold water of Charco Azul is refreshing and invigorating. It is not only a treat to the eyes, but an appeal to the senses as well. This pool does not disappoint especially for those wanting to experience nature perfection. For safety purposes, it would be best to visit during low tide. When the water level is high, and the waves are strong, swimming condition is a little dangerous, especially for novice swimmers. The crashing waves and the crystal-clear waters are astounding enough when seen from above. Even so, visitors who want to maximize their enjoyment can go snorkeling and discover the wonders beneath the sea. Charco de Azul is not only perfect for water activities, but it’s also a great place to catch a tan. There are several wooden sunbathing platforms by the ocean for free. What a lovely view sunbathers have while basking in the El Hierro sun. Charco de Azul is a nature photographer’s dream destination. The pool is enchanting at every corner and looks like a scene straight out of travel documentaries. It is usually isolated with only a few curious souls wandering on a regular basis. Hence, photographers can snap away without having to worry about editing photo-bombers. The pictures will undoubtedly be majestic just like the subject. Visitors who’ve had enough of taking dips in the chilly waters of Charco de Azul may explore its nearby attractions. The scenes in town dramatically change almost every moment. Remarkable emerald foliage, dewy forest woods, and valleys await guests. Volcanic landscape and special viewpoints to the stunning Atlantic Ocean are delights to the senses. There are a few things that guests must keep in mind when visiting Charco de Azul. This is especially helpful for the first time and solo travelers. The access to Charco Azul is free, but tourists have to bring their equipment for the water adventures. Those wanting to camp out must also bring their tents. Bear in mind that there are limited stores and business establishments in the area so bringing of own supplies is a must. The road map into the natural pool is exciting and challenging at the same time. The stroll to the pool and back is not a walk in the park either. Visitors may not be able to find an easy route, but the stunning beauty of Charco Azul is well worth the visit. This unknown gem exudes tranquility and visitors find themselves easing up from the downhill trek just by the sight of it. The majority of the trek will be on rocks formed by lava. Although these rocks have already been flattened a bit by years of stepping on them, it would be best to pack your comfortable pair of shoes. For ultimate comfort, bringing water booties is also recommended. El Hierro is the smallest island in the Canaries. Only about a hundred thousand individuals have the benefit of calling this haven home. It may have a lot to catch up on when it comes to modern amenities, but lodgings and fake shorelines haven’t ruined at least the magnificent landscape of the island. El Hierro offers explorers an opportunity to connect with nature with its dazzling scenes and towns. Tranquility is what the island radiates, and that is also what Charco Azul is famous for. Visitors wanting to take a break from the hustle and bustle of other islands in the Canaries find refuge in El Hierro, even just for a short while. Charco Azul, on the other hand, delivers just that to its visitors with its isolation and intimate feel. They say a rough day at the ocean is better than any day at the office. Then, why not aim for an ocean with stunning natural pools by the shore? Charco Azul inevitably takes ocean experiences to the next level, and this adventure is undoubtedly etched in the hearts and minds of each visitor.